Wardrobe in transparent extralight 12 mm. tempered and thermo-welded glass, with precision bevelling which reflects and refracts the light. The base is in extralight mirror, the coat hanger bar and the hardware are in polished steel. On the base is a small bench in the same material and with the same features of the storage unit. The doors, in transparent extralight 8 mm. tempered glass, open with a practical push-pull system. 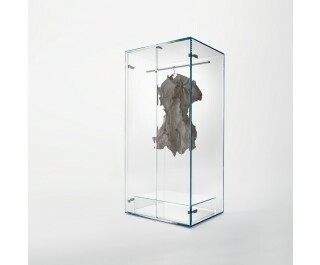 Clothing and objects within are visually enhanced and highlighted by this display unit.